103012: Our first ever pumpkin carving event. I’ve been a mom for 10 years, and I have gotten away without carving a pumpkin. 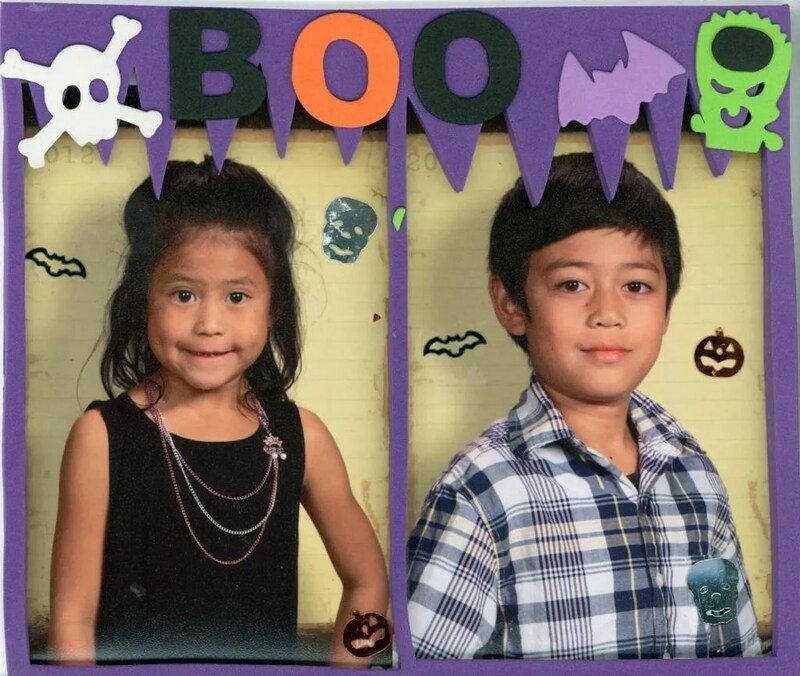 This year, with all the sudden decor frenzy and my daughter’s dad ended up buying her a pumpkin from the patch [which I also managed to skip here and there], her school needing pumpkin donations, and my son not having a pumpkin at all – so we all went to the store and bought 2 pumpkins. 1 for the school and 1 for my son. I figured, we’ll just stick stickers on it, or paint it and be done with it. I guess it didn’t end there. My boss was kind enough to have found a monkey skeleton pattern, sure enough, my daughter went ballistic! 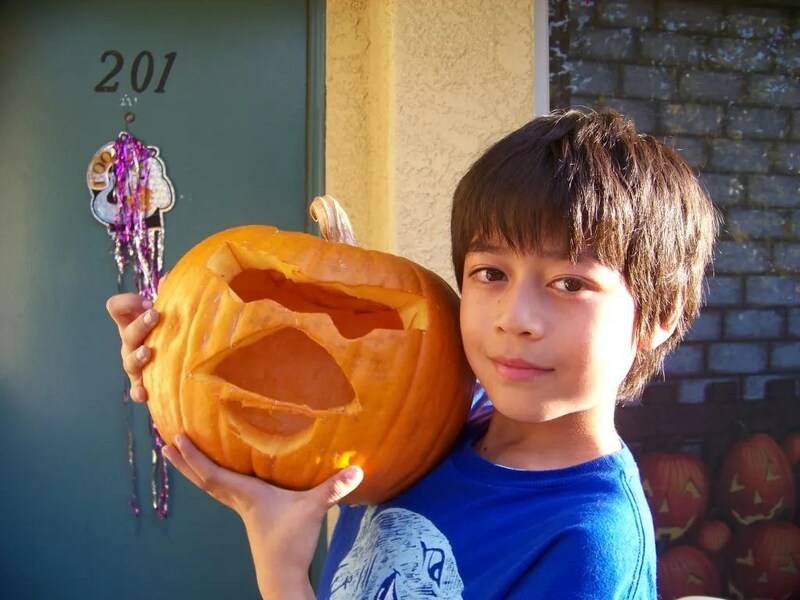 My son was happy thinking he gets to carve the one pattern they both wanted….nope. I managed to find a simple Angry Bird pattern for him. 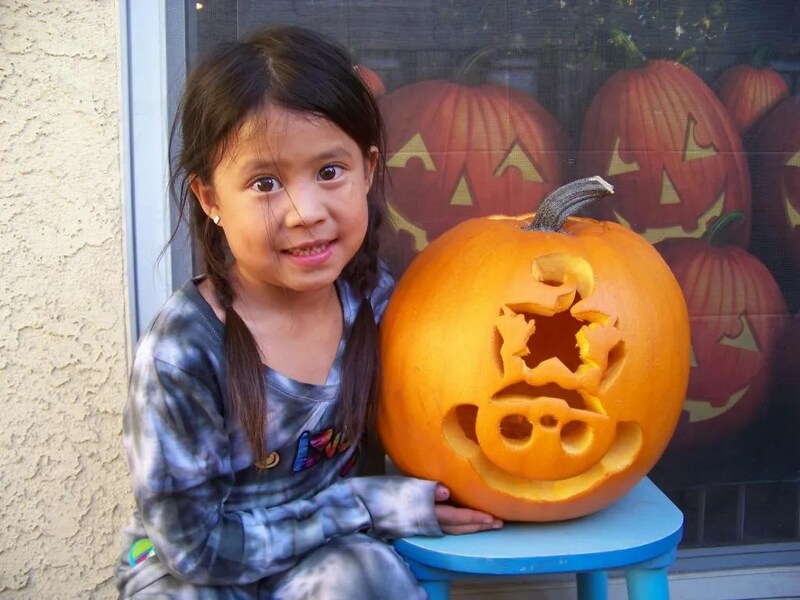 It’s Halloween Eve and I really was thinking of letting the pumpkins be – but I guess, I still have enough decorating juice left in me and the kids were truly excited to be carving for the 1st time. I must say, I’m glad that I did this family activity. My son could not stop saying he loves family times like this. I’m proud to say that my son did 99% of the work on his pumpkin! He’s proud too. My daughter who’s had carving experience from her dad’s side tried her best, and ended up being the cleaning helper. She poked a few holes on the pumpkin, and decided that Power Rangers is more exciting. Nevertheless, I finished her pumpkin, and she was proud that her mommy did it for her. It’s too dark to take pics so I’ll take them tomorrow morning and night when I have fresh batteries and a tea light to go inside the lanterns. 10/31/12 Update: Here’s the pumpkins that they carved the night before. The kids were not too satisfied with their plate craft. We ALL made a mistake on gluing on the whole plate that the picture came out fuzzy. We have left over plates enough for the both of them, so they decided to go make another one and give the first ones to their dad’s as a Halloween present. 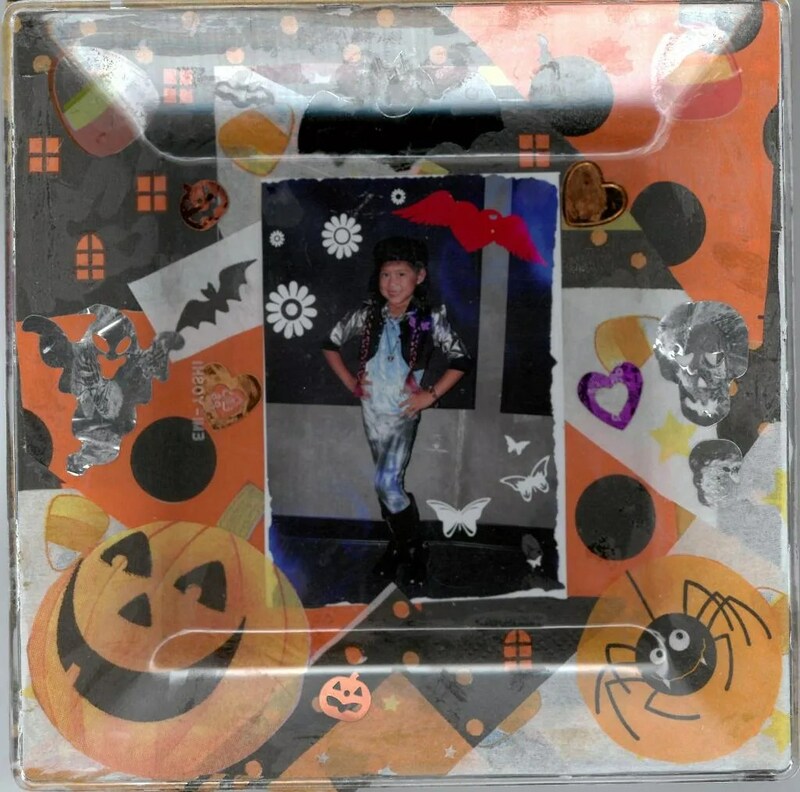 This time we learned to glue the corners of the picture! I’ll update this post as soon as I get a new set of clear plates. 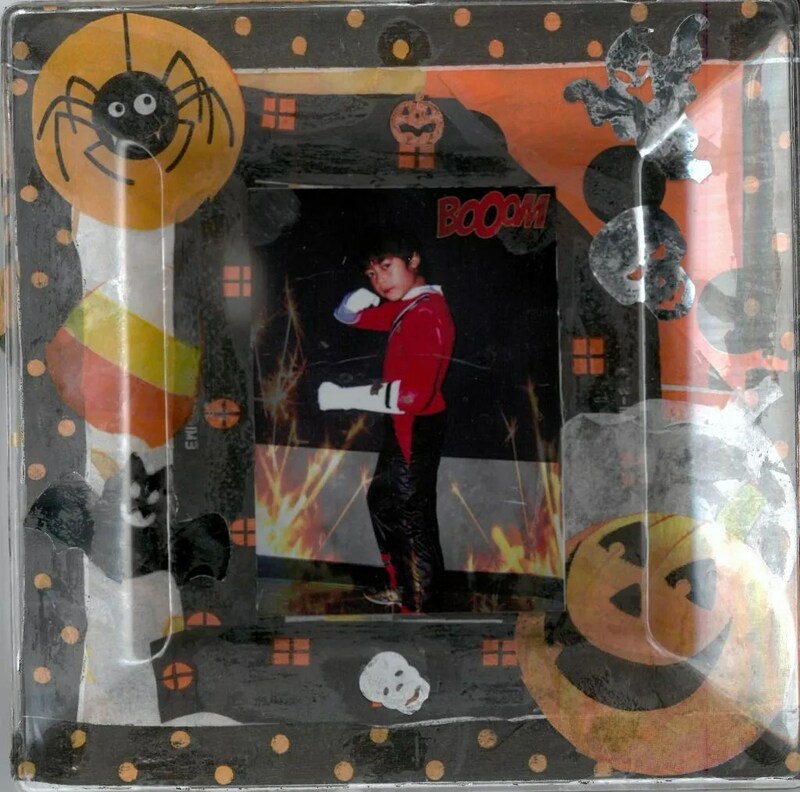 Since I have to make another one for their remaining picture, and I’m dressing up this year, so I would want my pic up on the wall too. It was Red Ribbon Week this week at my kids’ school. On one of the days, the theme was wear a tie dye shirt OR your favorite peace sign shirt. My daughter wanted to wear a new tie dyed shirt for Red Ribbon Week, not only that – she also wanted to put patches on. Who am I to say no? 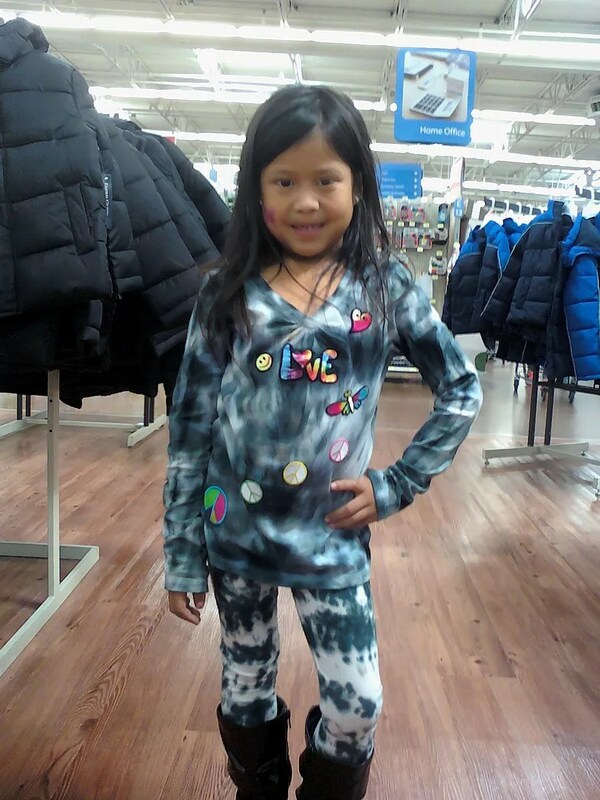 I got her a long sleeve shirt and another pair of tights to dye since the one for he costume was a size smaller – again my princess tie dyed to her hearts content! Okay- Here are the finished products. 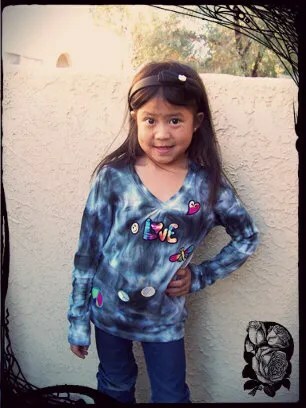 The tie dyed shirt with the patches that she wanted on. I didn’t have time to put all the patches on the actual day, but she managed to wear a pair of pants with a peace sign, but none the less, she’s proud that she ti dyed something new. She still gets to wear this since it’s a long sleeved shirt. Update: I finally found the time to update my pics. I found this one on my phone…She’s wearing the other tights that she tie dyed. 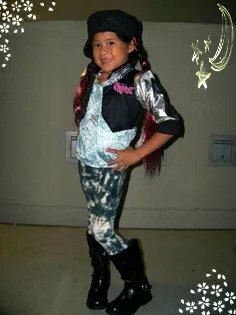 I purchased a Bratz costumes online @ Party City back in September for my daughter’s birthday. My daughter fell in love with the idea of being Yasmin – but she likes Cloe’s outfit better. However, the leggings, tights -whatever you call it, are too long and it came in as gray. Whereas the image shown is white. Don’t know how my daughter noticed that detail. Since it’s an online only item – chances of me exchanging it is slim to none since stock was limited to begin with. Thankfully, my co-worker [AGAIN!] sparked an idea. She gave me links to stores that have tie dyed tights. Then it hit me!!! Her leggings are tie dyed! Why didn’t I realize that to begin with?? After work, while browsing at Target, I casually mentioned that we can tie dye her white tights at home – needless to say, my daughter wanted to tie dye. So yeah – I spent a little bit more cash since she wanted a brand new white tights + cost of tie dye. We went home, and she went right on it. It happened so fast, I couldn’t even get my camera on time to take her pictures-with gloves and all. Well – she did it so fast, that she decided to tie dye an older pair of white pants too. The tights are now ready for use. Ladies and gentlemen, this is my daughter wearing her tie dyed costume project. On to the next DIY! 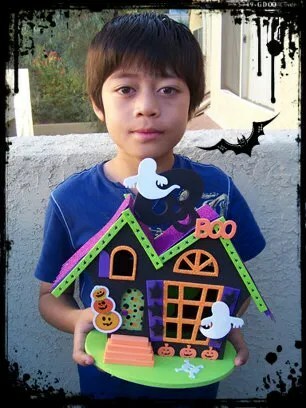 Another Halloween craft coming really soon! It’s about time my crafter’s block has been lifted. I’m sure I’ve mentioned that I’ve been down in the slumps since my paycheck has been telling me that I can’t splurge on DIY creations. I have been bit by the decorating bug! 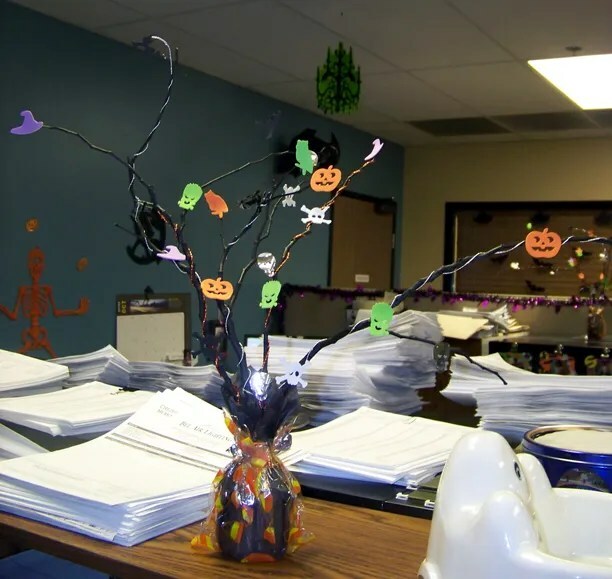 It all started at work one morning that some office spaces were decorated for Halloween. Naturally, the rest of us that didn’t have any decorations [our department] wanted to decorate too. Needless to say, it was a very fun Friday! Our department has been flowing so smoothly – that we didn’t even have to assign who brings what – we all just banded together and help decorate each others’ space. That moment – I knew I was working with the best department in the company – EVER. 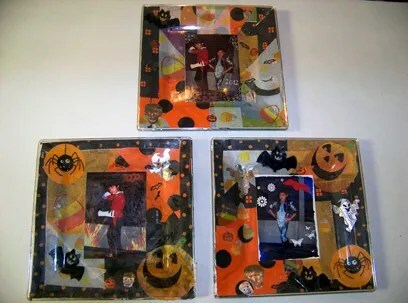 I felt bad that I couldn’t contribute as much to the décor, then it hit me, I can make a DIY Halloween décor. So I was thinking, what else is missing? 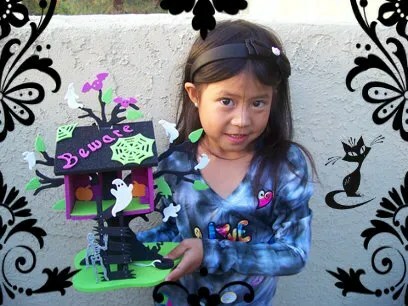 We have bats, spiders, tombstones, webbing, and garlands. 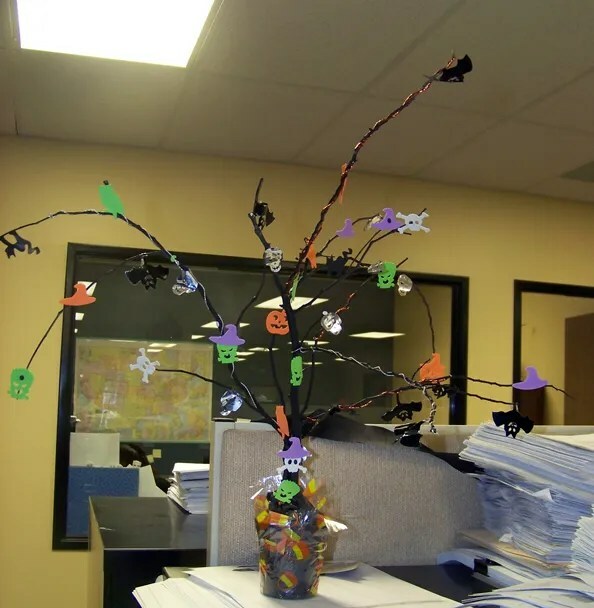 Google showed an image of a DIY Halloween tree and I’m like, WHY NOT?? I made sure that even if it goes out of my budget I will make these. Well – It must be meant to be. As I was parking at my local Walmart, tree trimmers have bags full of branches that were freshly trimmed!!! There’s nothing like free stuff to make your Saturday morning. The family spent a few minutes, picking out branches, after breakfast we went home, and took the rest of the morning taking the leaves out to leave the branches out to dry. Sunday night – again at my local Walmart – I found 96 cent spray paints – yes 96 cents spray paints!!! 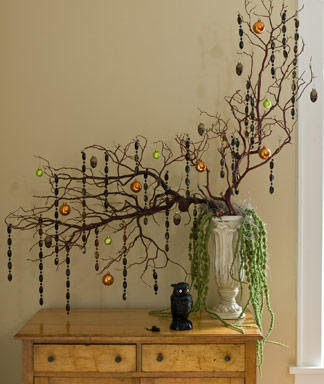 I spent a few minutes gathering the branches together and a few more spray painting them. FYI this was my first attempt at using spray paints. We made a total of 4 trees, my kids are getting full credit for placing the stickers! 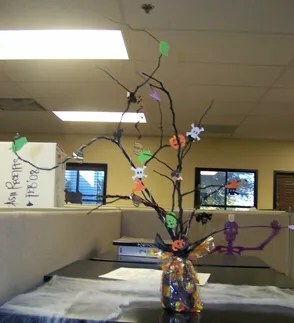 10/16/12: Halloween Tress @ work. Base: Water bottles, Chuck E Cheese token holders, Yogurt cup, gift tissue paper, treat bags, sand. 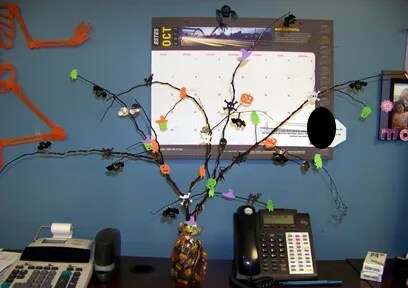 Tree: Tree branches, wire garland [took of the skulls/bats and just used the wire], spray paint, foam stickers. I would like to give special thanks to my co-workers who has ignited my crafting spark this month, and for allowing me to provide a gift from my heart. Special mention to my children, who takes an interest in mommy’s arts and crafts.